I have made a start in recording the list of on stage appearances for the period 1963 until 1988 by initially covering 1988 which was of course The Smycms Silver Jubilee Production of Rose Marie. Now that only leaves the previous 24 years to record, PHEW!!. If you are an ex-member reading this and you have any old programs or even old photos, I would love to hear from you so I can complete this task. The following photo is courtesy of Smycms Facebook page and dates from 1985 and the Smycms Production of The Most Happy Fella by Frank Loesser, which included songs such as Standing On The Corner, Happy To Make Your Acquaintance, My Heart Is So Full Of You and of course the title song The Most Happy Fella. This romantic musical tells the story 0f love in the Napa Valley of good ol’ U.S.A. Love blossoms among the grapes and wine, when aging vintner Tony falls for a mail-order bride, unfortunately his intended has a photo of Tony’s young handsome foreman and….. yes you’ve guessed it , it all ends happily ever after, like all Broadway shows. UPDATE 15/11/2017 So I was wrong the chef on the right is Derek Jardine. 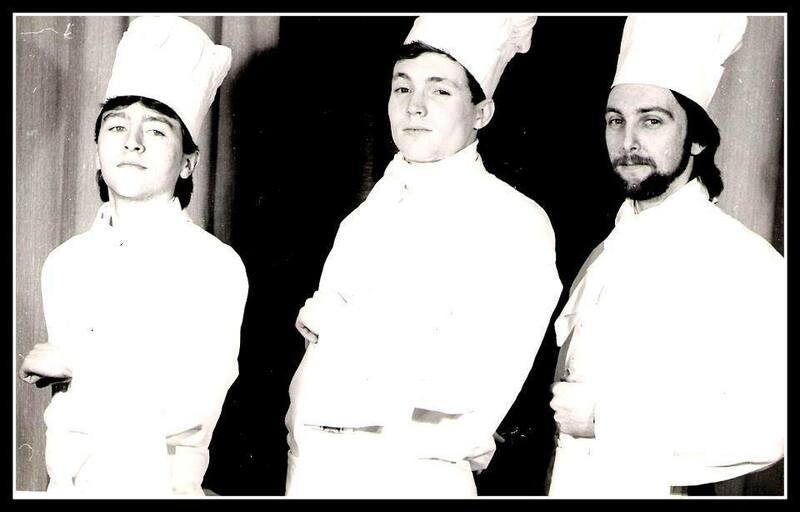 We can also confirm that the chef on the left is Craig Gibson and the one in the middle is Donald Rae. Hi Tony. I have programmes from 1981 to the end. Let me know which ones you need the cast list from as I suspect you will have quite a few yourself. The gent on the right in the photo is Derek Jardine. Thanks Craig for putting me right. Cheers Tony.